Tariffs are taxes levied on imported goods and therefore raise prices on imports in the same way that a sales tax raises the price consumers and businesses pay for goods and services. Tariffs reduce domestic GDP mostly by raising the prices paid by U.S. consumers and businesses, which reduces the purchasing power of domestic consumers and increases the cost of business investment. So, with the economy slowing, why choose policies that slow things further? It’s an unforced error that should be rectified, to head off impacts on jobs and economic opportunity. 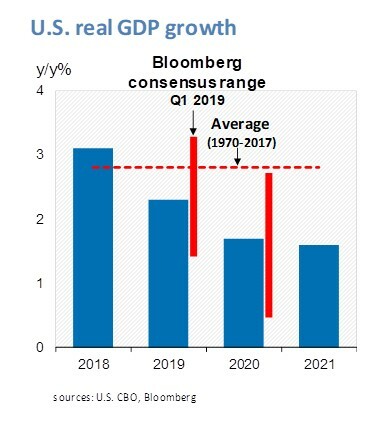 Again, this is CBO – long recognized as an authority on economic issues – saying that current tariff policy is hurting the U.S., further weakening an already slowing economy. In the short run, CBO projects that the newly implemented tariffs will raise the prices paid by U.S. consumers and businesses directly by making imported goods more expensive and, indirectly, by making the goods and services produced with imported goods more costly. Like other price increases that result from taxes, those higher prices will reduce consumer spending by diminishing the purchasing power of consumer income and will reduce investment by making capital goods more expensive.